Chemokines are hormone-like signaling molecules secreted by cells to signal infection and guide the immune response. Following a decade of basic chemokine research, the pharmaceutical industry has now begun to exploit this crucial signaling pathway for the development of innovative drugs against AIDS, cancer, neural and autoimmune diseases. Here is the first reference focusing on these novel drug development opportunities. Opening with a general introduction on chemokine function and chemokine receptor biology, the second part covers the known implications of these signaling molecules in human diseases, such as cancer, neural disorders, and viral infection, including AIDS. 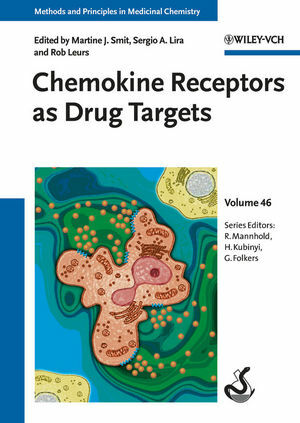 The third part systematically surveys current drug development efforts at targeting individual chemokine receptors, as well as other chemokine interaction partners, including up-to-date reports from the pharmaceutical industry. The editors are based at the Amsterdam Center for Drug Research, a cross-disciplinary center in the Dutch academic system, but with numerous ties to pharmaceutical companies. Targeting Chemokine Receptor Dimers: Are there Two (or More) to Tango?